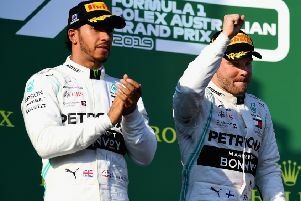 Mercedes driver Valtteri Bottas of Finland sprays himself with champagne after winning the Australian Grand Prix ahead of team-mate Lewis Hamilton. Picture: AP. The Finn was out-qualified by Lewis Hamilton, pictured, in Melbourne but was quicker into turn one and rounded off a stellar weekend by taking the bonus point for fastest lap. After taking the chequered flag, he served up a four-letter riposte to those who had criticised him in the past. “To whom it may concern, f*** you,” the 29-year-old said. Red Bull’s Max Verstappen pushed Hamilton hard for the second step on the podium, while Ferrari were left to regroup after Sebastian Vettel and Charles Leclerc finished fourth and fifth, nearly a minute back. 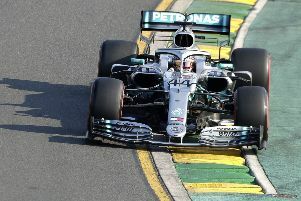 Hamilton said wheelspin may have been to blame as he failed to capitalise on his pole position but Bottas deservedly took the 25 points for the win, putting the hammer down with a string of fastest laps on tyres that had carried him nearly 20 times around the 3.295-mile circuit after those around him had made their stop. As the contest reached half distance it was a one-horse race with Verstappen making a late bid for the fastest lap which was surpassed on the penultimate circuit by Bottas with a one minute 25.580 second-effort. For the Briton, it was his fourth consecutive pole position around Albert Park and his fourth consecutive second-place finish. For Ferrari, their weekend could possibly be summed up in one radio exchange when Vettel asked “Why are we so slow?” two thirds into the race and hopes of a podium fading fast after Verstappen went clear. “We don’t know at the moment,” came the reply from the pit wall. Leclerc appeared to be closing in on Vettel towards the latter part of the race as he made the most of his fresher tyres but appeared to back off from Vettel in the closing stages – despite suggestions earlier in the weekend that the pair were free to race. Haas’ Kevin Magnussen was the best of the rest, while Renault’s Nico Hulkenberg, Kimi Raikkonen for Alfa Romeo, Racing Point’s Lance Stroll and Toro Rosso driver Daniil Kvyat also scored points. Lando Norris wound up 12th in his McLaren and fellow British rookie George Russell was 16th in the Williams.